This artwork illustrates that corruption is the root cause for the major problems afflicting societies today. 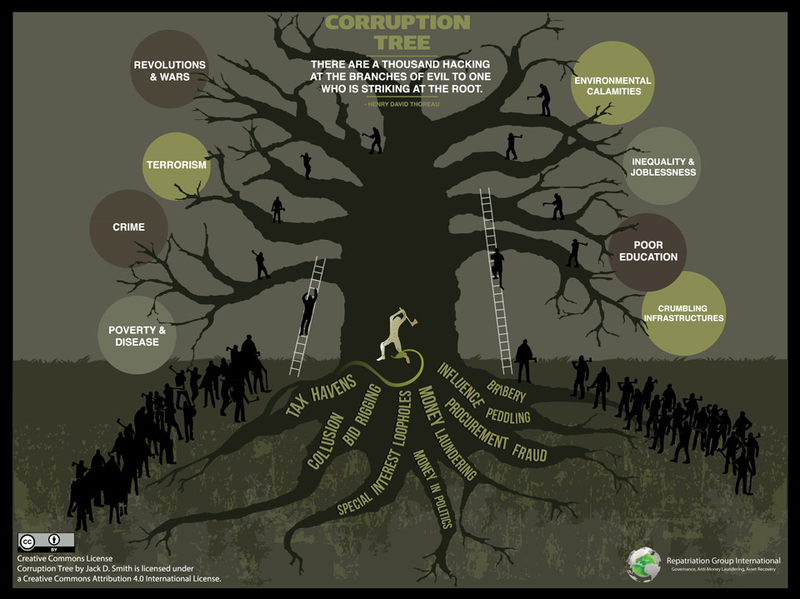 Click on each “branch of evil” to view a sample of the articles and reports substantiating the impact of corruption for that sector. Afghan government corruption drove indignant citizens into the arms of the Taliban. The 2011 Arab Spring movement amounted to a mass uprising against kleptocratic practices. “Acute government corruption may in fact lie at the root of some of the world’s most dangerous and disruptive security challenges– including the spread of violent extremism.” Chayes, Sarah, Thieves of State, W. Norton & Company, Inc. (2015), at p. 7. “Countries with weak government effectiveness, rule of law, and control of corruption have a 30% – 45% higher risk of civil war, and significantly higher risk of extreme criminal violence than other developing countries.” World Development Report (2011), retrieved 10/1/15, http://web.worldbank.org/archive/website01306/web/early-findings.html. Sierra Leone Civil War (1991-2002), Report of Truth and Reconciliation Commission (2004): “[The] central cause of the war was endemic greed, corruption and nepotism that deprived the nation of its dignity and reduced most people to a state of poverty.” Witness to the Truth (2004), Vol. II, at p. 27, retrieved 10/1/15, http://www.sierraleonetrc.org/index.php/view-report-text-vol-2/item/volume-two-chapter-two. Political corruption causes or worsens the state of poverty, which leads to conflicts, with the negative impacts that hinder development. Ikejiaku, Brian-Vincent, The Relationship between Poverty, Conflict and Development, Journal of Sustainable Development, Vol. 2, No.1 (2009), at p. 22, retrieved 10/1/15, http://www.ccsenet.org/journal/index.php/jsd/article/view/231/191. Afghan government corruption drove indignant citizens into the arms of the Taliban. The 2011 Arab Spring movement amounted to a mass uprising against kleptocratic practices. “Acute government corruption may in fact lie at the root of some of the world’s most dangerous and disruptive security challenges– among them the spread of violent extremism.” Chayes, Sarah, Thieves of State, W. Norton & Company, Inc. (2015), at p. 7. Applying the Johansen cointegration analysis technique upon data for the Middle East and North Africa (MENA) countries demonstrates that the more corrupted the governments are, the more likely the extremist groups in those countries are to get involved in terrorist activities. Therefore, the proposed motivation for terrorism as “revenge against corruption” fits the data appropriately. This analysis suggests that terrorism is less about Islam against Western values and more about revenge against corrupt regimes in the Middle East. Policymakers interested in fighting terrorism may find it useful to pay more attention to the struggle against corruption, since the two are co-integrated. Anaraki, Nahid Kalbasi, Corruption and Terrorism: Will They Undermine the Arab Spring? Heritage Foundation Index of Economic Freedom (2012), retrieved 10/1/15, https://thf_media.s3.amazonaws.com/index/pdf/2012/chapter4.pdf. “The link between corruption and instability has never been clearer. In countries where corruption is rife, problems with security and terrorism are rife.” Tackle instability and terrorism by fighting corruption, Transparency International, retrieved 10/1/15, http://www.transparency.org/news/feature/tackle_instability_and_terrorism_by_fighting_corruption. This paper recognizes that there are both religious and ethnic variables that influence these terrorist acts, but finds official corruption and state neglect of the masses stands out as the most persuasive, compelling primary explanation for terrorism in Nigeria. Zumve, Samuel, Terrorism in Contemporary Nigeria: A Latent Function of Official Corruption and State Neglect, European Scientific Journal, Vol. 9, No. 8 (2013), retrieved 10/1/15, http://eujournal.org/index.php/esj/article/viewFile/882/925. Organized crime is one of the major threats to development and security. Deficiencies in judicial and enforcement tools play a strategic role in the growth of criminal syndicates’ management of trafficking drugs, arms, human beings, counterfeiting and money laundering. Through corruption, criminal groups generate poverty. Organized crime adopts all forms of corruption to infiltrate political, economic and social levels all over the world. Strong institutional capacities are therefore crucial to address effectively the successfulness of organized crime syndicates. Organized Crime and Corruption, United Nations Interregional Crime and Justice Research Institute, retrieved 10/1/15, http://www.unicri.it/topics/organized_crime_corruption/. The European Commission (EC) contracted the Center for the Study of Democracy (CSD) to analyze the links between organized crime and corruption. CSD examined how politicians/government administration, police, customs, the judiciary, and private companies are targeted in 27 member states. Prostitution and illegal drugs markets exert the most corruptive effect, and political corruption is organized crime’s most powerful tool. Reforms like creating internal corruption investigative departments are proposed. Examining the Links Between Organized Crime and Corruption, Center for the Study of Democracy (2010), retrieved 10/1/15, http://ec.europa.eu/dgs/home-affairs/doc_centre/crime/docs/study_on_links_between_organised_crime_and_corruption_en.pdf. The size of organized crime units is clearly linked to police behavior, increasing with its degree of corruption and inefficiency. The degree of protection of property rights – widely defined – has been considered as a key institution and assigned large weight in determining economic growth rates. The police have strong impacts on interpersonal behavior and the de facto determination of property rights in any society through their ability to sanction and punish with or without basis in law. High crime rates may also have devastating impacts on investments and economic growth. Reform ideas are discussed. Andvig, Jens Chr., Crime, Poverty and Police Corruption in Developing Countries, CMI Working Paper (Norway 2008), retrieved 10/1/15, http://www.cmi.no/publications/file/3076-crime-poverty-police-corruption-in-developing.pdf. The stability of the state depends in large part on the reliability of its regulatory and criminal justice systems. The success of many organized criminal operations depends on penetrating and corrupting these systems. Therefore, combatting organized crime is a matter of national security. This paper discusses the nature of the threats posed by transnational organized crime and the importance of corruption to the success of its operations including human trafficking, migrant smuggling, drug, firearms and environmental resource trafficking, product counterfeiting, maritime piracy and cybercrime. The Globalization of Crime, United Nations Office on Drugs and Crime (2010), retrieved 10/1/15, https://www.unodc.org/documents/data-and-analysis/tocta/TOCTA_Report_2010_low_res.pdf. “Let’s not mince words: In the developing world, corruption is public enemy number one. … Every dollar that a corrupt official or a corrupt business person puts in their pocket is a dollar stolen from a pregnant woman who needs health care; or from a girl or a boy who deserves an education; or from communities that need water, roads, and schools.” Remarks of World Bank Group President Jim Yong Kim at the “Speak Up Against Corruption” Event, Washington, D.C. (2013), retrieved 10/1/15, www.worldbank.org/en/news/speech/2013/12/19/world-bank-group-president-jim-yong-kim-corruption-event. World Bank research findings suggest that “by tackling corruption and improving the rule of law, countries can increase their national incomes by ‘as much as four times in the long term and child mortality can fall as much as 75 percent.” The consequences of corruption include: increased poverty and decreased economic growth; maltreatment of women; proliferation of armed conflicts; subverting humanitarian and reconstruction assistance; enabling organized crime and violations of human rights; and aggravating the likelihood of fatalities from treatable illnesses, child mortality, child and maternal death rates during childbirth, HIV/AIDS and malaria. Primer on Corruption and Development, United Nations Development Program (2008), retrieved 10/1/15, http://www.undp.org/content/dam/aplaws/publication/en/publications/democratic-governance/dg-publications-for-website/corruption/Corruption_and_Development_Primer_2008.pdf. High and rising corruption increases income inequality and poverty by reducing economic growth, the progressivity of the tax system, the level and effectiveness of social spending, and the formation of human capital. Corruption also increases income inequality and poverty by perpetuating an unequal distribution of asset ownership and unequal access to education. Gupta, Sanjeev; Davoodi, Hamid; and Alonso-Terme, Rosa; Does Corruption Affect Income Inequality and Poverty? IMF Working Paper (1998), retrieved 10/1/15, https://www.imf.org/external/pubs/ft/wp/wp9876.pdf. Nigerian academics examined economic indices to ascertain why poverty rates in their country have been rising in recent years, and they determined that the primary cause has been political corruption. They found that corruption has not only robbed the nation of finances that should have been used for development to benefit all citizens including the poor; but in some cases led to hijacking by the privileged class of funds meant for the poor, thereby denying the poor the opportunity to grow out of poverty. Ogboru, I. and Abimiku, A.C., The Impact of Corruption on Poverty Reduction Efforts in Nigeria (2015), at p. 1, retrieved October 1, 2015, http://www.researchgate.net/publication/228469169_THE_IMPACT_OF_CORRUPTION_ON_POVERTY_REDUCTION_EFFORTS_IN_NIGERIA. A cross-country analysis of the relationship between corruption and healthcare and education shows that, “[c]hild mortality rates in countries with high corruption are about one-third higher than in countries with low corruption; infant mortality rates and percent of low-birth weight babies are almost twice as high, and dropout rates are five times as high.” Gupta, Sanjeev; Davoodi, Hamid; and Tiongson, Erwin; Corruption and the Provision of Healthcare and Education Services, IMF Working Paper (2000), retrieved 10/1/15, http://www.imf.org/external/pubs/ft/wp/2000/wp00116.pdf. Corruption reduces the resources effectively available for health, lowers the quality, equity and effectiveness of healthcare services, decreases the volume and increases the cost of providing services. It discourages people from using and paying for health services and ultimately has a corrosive impact on the population’s level of health. Corruption in the Health Sector, U4 Anti-Corruption Resource Center (2008), at p. 4, retrieved 10/1/15, http://www.u4.no/publications/corruption-in-the-health-sector-2/. This publication is a compilation of papers presented at a special event organized by the UNODC at the 4th COSP to the United Nations Convention against Corruption in Marrakesh, Morocco to assess the adverse impacts of corruption for wildlife species trafficking, hazardous waste management, petrol exploitation and forestry management. Corruption, Environment and the United Nations Convention Against Corruption (2012), retrieved 10/1/15, https://www.unodc.org/documents/corruption/Publications/2012/Corruption_Environment_and_the_UNCAC.pdf. Elephant ivory poaching has become a billion dollar business that threatens to render African elephants near-totally extinct within the next ten years, and funds a wide range of destabilizing actors across Africa with significant implications for violent conflicts. The business is monopolized by organized crime, and enabled by the corruption of government functionaries, security forces, and businessmen. The key to stopping it is the political will to dramatically expand international intelligence-sharing and enforcement of anti-money laundering and anti-corruption prohibitions. Vanishing point: Criminality, Corruption and the Devastation of Tanzania’s Elephants, Environmental Investigation Agency (2014), retrieved 10/1/15, https://eia-international.org/wp-content/uploads/EIA-Vanishing-Point-lo-res1.pdf. Varun Vira and Thonas Ewing, Ivory’s Curse: The Militarization & Professionalization of Poaching in Africa (2014), retrieved 10/1/15, http://www.bornfreeusa.org/a9_ivorys_curse.php. The consequences of the failure of forest law enforcement are enormous—and extend far beyond the damage to the trees themselves. Illegal logging generates approximately US$10–15 billion annually worldwide. It threatens biodiversity, increases carbon emissions, causes landslides, and undermines the resource-based livelihoods of rural peoples, with ringleaders and organized crime profiting at the expense of the poor. This paper calls for an integrated criminal justice strategy for illegal logging that targets high-level corruption and the companies that pay bribes. Justice for Forests: Improving Criminal Justice Efforts to Combat Illegal Logging, World Bank Study (2012), retrieved 10/1/15, http://siteresources.worldbank.org/EXTFINANCIALSECTOR/Resources/Illegal_Logging.pdf. See also, Tackling Illegal Logging and the Related Trade: What Progress and Where Next? Chatham House (2015), retrieved 10/1/15, http://indicators.chathamhouse.org/sites/files/reports/Tackling%20Illegal%20Logging%20and%20Related%20Trade.pdf. The planet’s tropical forests play a vital role in moderating the atmosphere, sequestrating greenhouse gases, delivering watershed management and are home to a rich and biologically important array of plants and animals. Illegal logging, fires and palm oil plantations have created a state of emergency generating massive pollution and destroying the last safe-holds for endangered species such as the Sumatran tiger and the orangutan. Long-term initiatives like reducing corruption and certification of timber require substantial support from the international community and may not help in time. Indonesia’s rapid response ranger units must be reinforced and given paramilitary training, equipment and a mandate to prevent illegal loggers from operating inside protected areas. The Last Stand of the Orangutan, State of Emergency: Illegal Logging, Fire and Palm oil in Indonesia’s National Parks, United Nations Environmental Programme (2007), retrieved 10/1/15, http://www.grida.no/files/publications/orangutan-full.pdf. Construction linked to urban development and waste management are among the sectors most prone to corruption at local level. EU Anti-Corruption Report, European Commission (2014), retrieved 10/1/15, http://ec.europa.eu/dgs/home-affairs/e-library/documents/policies/organized-crime-and-human-trafficking/corruption/docs/acr_2014_en.pdf. The “Triangle of Death” is an area NE of Naples, Italy, where 550,000 people live. For over 20 years, corrupt Italian politicians and government officials allowed the Camorra mafia organization to bury an estimated 220 million tons of illegal garbage there. The wastes included toxic and nuclear materials collected from countries all across Europe. Farmland and water systems are now contaminated, and rates of birth defects and several cancers far exceed national averages. A Mafia legacy taints the earth in southern Italy, New York times(1/29/14), retrieved 10/1/15, http://www.nytimes.com/2014/01/30/world/europe/beneath-southern-italy-a-deadly-mob-legacy.html; The Mafias Deadly Garbage: Italy’s Growing Toxic Waste Scandal, Der Speigel (1/16/14), retrieved 10/1/15, http://www.spiegel.de/international/europe/anger-rises-in-italy-over-toxic-waste-dumps-from-the-mafia-a-943630.html. An increase of one standard deviation in corruption increases the Gini coefficient of income inequality by about 11 points and reduces income growth of the poor by about 5 percentage points per year. Corruption affects income inequality and poverty through various channels, including overall growth, biased tax systems, and poor targeting of social programs, as well as through its impact on asset ownership, human capital formation, education inequalities, and uncertainty in factor accumulation. Gupta, Sanjeev; Davoodi, Hamid; and Alonso-Terme, Rosa; Does Corruption Affect Income Inequality and Poverty? Economics of Governance (2002), retrieved 10/1/15, http://pria-academy.org/pdf/ISA/m2/m2-1-Corruption-IncomeIneq-Pov.pdf. An increase in inequality by one percentage point by making the rich richer lowersGDP growth in a country over the next five years by 0.08 percentage points. However, making the poor and the middle class one percentage point richer can raise GDP growth by as much as 0.38 percentage points (Chart 2). Thus, boosting the incomes of the poor and the middle class can help raise growth prospects for all. Dabla-Norris, Era, et al., Causes and Consequences of Income Inequality: A Global Perspective, IMF Staff Discussion Note (2015), retrieved 10/1/15, http://www.imf.org/external/pubs/ft/sdn/2015/sdn1513.pdf. Corruption and inability to follow the rule of law have led to unemployment, poverty, violence of unyielding proportion, insecurity, lack of infrastructural facilities and lack of integrated rural development in Africa. Oyewo, Ajagbe Toriola, Examination of the Root Causes of Unsustainable Development in Africa, Journal of Sustainable Development in Africa (Vol. 16, No.4, 2014), retrieved 10/1/15, http://www.jsd-africa.com/Jsda/Vol16No4-Sum14B/PDF/Examination%20of%20the%20Root%20Causes%20of%20Unsustainable.Toriola%20Oyewo.pdf. Analysis of data on corruption, poverty and growth for 18 African countries for the 1996-2001 time periods shows that as countries become less corrupted, income inequality is reduced. As countries get more corrupted, income inequality is increased. Inequality does not cause corruption, but corruption causes inequality. N’Zue, Felix Fofana, N’Guessan, Coffi Jose Francis, The Causality Between Corruption, Poverty and Growth: A Panel Data Analysis, Secretariat for institutional Support for Economic Research in Africa (2006), retrieved 10/1/15, http://pdf.usaid.gov/pdf_docs/Pnadh629.pdf. Cf. Uslaner, Eric M., Corruption and Inequality (2011), retrieved 10/1/15, https://www.cesifo-group.de/ifoHome/publications/docbase/details.html?docId=16132624. There is strong support for the argument that many countries are caught in an “inequality trap” that begins with an undesirable level of inequality that leads to reduced trust, which leads to increasing corruption, which then circles back to more inequality. Corruption defeats educational aspirations in numerous ways, ranging from capital investment and school construction to examinations and diplomas. “[C]orrupt schools and universities hinder prosperity, cause long-term damage to societies and raise the cost of education at the expense of equity and quality.” Also, in a society where dishonesty and corruption are rewarded, the younger generations develop attitudes of cynicism and discouragement that can have serious economic and governance consequences. Consequences of Corruption at the Sector Level and Implications for Economic Growth and Development, OECD Publishing, Paris (2015), at pp. 64-69, retrieved 10/1/15, http://www.oecd-ilibrary.org/governance/consequences-of-corruption-at-the-sector-level-and-implications-for-economic-growth-and-development_9789264230781-en. Education constitutes the largest element in the public sector of many countries, often accounting for over a fifth of expenditures. When the funds do not reach their intended targets, the result is retarded country development, sometimes for generations. In Nigeria $21 million was lost over two years, and double that in Kenya over five years. “Corruption in schools can include procurement and construction, ‘shadow schools’ (there are claims of up to 8000 in Pakistan alone),” ‘ghost teachers’ and the diversion of resources intended for text books and supplies, bribery in access to education and the buying of grades, nepotism in teacher appointments and fake diplomas, the misuse of school grants for private gain, absenteeism, and private tutoring in place of formal teaching (costing South Korean households some $17 billion, or 80% of total government expenditure on education in 2006 alone).” Global Report: Education, Transparency Intl (2013), retrieved 10/1/15, http://www.transparency.org/gcr_education/content/framework. High levels of corruption in US states distort budget allocations for education. “States with higher levels of corruption are likely to favor capital, construction, highways, total salaries and wages, borrowing, correction, and police protection, at the expense of social sectors such as total education, elementary and secondary education, health, and hospitals.” Expenditures on education do not provide as many “lucrative” opportunities for corrupt officials as other components of spending such as construction. The Impact of Public Officials Corruption on the Size and Allocation of US State Spending, Public Administration Review (2014), Vol. 74, No.3, at p. 353, available at, http://onlinelibrary.wiley.com/doi/10.1111/puar.12212/abstract?userIsAuthenticated=false&deniedAccessCustomisedMessage=. School inputs such as computer labs, teaching supplies, and teacher training are reduced in the presence of corruption. Students residing in municipalities where corruption in education is evident score 0.35 standard deviations less on standardized tests, and have significantly higher dropout and failure rates. Ferraz, Claudio, Finan, Frederico and Moreria, Diana, Corrupting Learning: Evidence from Missing Federal Education Funds in Brazil (2012), retrieved 10/1/15, http://www.transparency.org/gcr_education/content/framework. International development agencies like the World Bank and the UK’s Department for International Development (DFID) spend from 30% to 60% of their budgets on infrastructure projects in developing countries. DFID has safeguards to insure its grants are not wasted including, “a strong focus across our portfolio on results, fighting corruption and increasing transparency.” “Helping countries improve on how they deliver infrastructure services is central to achieving economic development and providing poor people with opportunities to escape poverty. Reliable, accessible energy, transport and communication services support increased productivity, facilitate trade and create an environment in which business can flourish. Access to infrastructure enables people to take advantage of economic opportunities and access markets, jobs, information and training.” Sustainable infrastructure for shared prosperity and poverty reduction: A policy framework, DFID (2015), retrieved 10/1/15, https://www.gov.uk/government/uploads/system/uploads/attachment_data/file/398543/Infrastructure-policy-framework-summary.pdf. Corruption in large infrastructure projects – such as roads, dams, irrigation canals, power plants, ports, airports, schools, and hospitals –damages developing countries by reducing growth because of: (1) higher public investment on projects with lower productivity; (2) lower government revenues; (3) lower expenditures on operations and maintenance; and (4) lower quality of public infrastructure. Tanzi, Vito and Davoodi, Hamid, Road to Nowhere: How Corruption in Public Investment Hurts Growth, International Monetary Fund (1997), retrieved 10/1/15, http://www.imf.org/external/pubs/ft/issues12/. See also, Consequences of Corruption at the Sector Level and Implications for Economic Growth and Development, OECD Publishing, Paris (2015), at pp. 54-61, at pp. 46-52, retrieved 10/1/15, http://www.oecd-ilibrary.org/governance/consequences-of-corruption-at-the-sector-level-and-implications-for-economic-growth-and-development_9789264230781-en. Governance is central to development outcomes in infrastructure, not least because corruption (a symptom of failed governance) can have significantly negative impacts on returns to infrastructure investment. This paper looks at what has been learned about the role of governance in infrastructure, provides some recent examples of reform efforts and project approaches, and suggests an agenda for greater engagement to improve governance and reduce the development impact of corruption. Kenny, Charles, Infrastructure Governance and Corruption: Where Next? The World Bank Sustainable Development Network (2007), retrieved 10/1/15, https://openknowledge.worldbank.org/handle/10986/7314. Estimates of financial losses due to corruption on infrastructure projects range between 10% and 30% of the value of publicly funded construction projects, as much as $2.5 trillion per year. For instance, a 2010 report from the Zambia Auditor General’s Office described how $250 million was misappropriated over a three-year period by payments for work that was not started and use of substandard materials on construction sites. This paper provides guidelines for identifying and mitigating the risk of corruption, as well as tools that can be integrated into infrastructure interventions by development institutions. Hawkins, John, Reducing Corruption in Infrastructure Sectors (2013), retrieved 10/1/15, http://www.u4.no/recommended-reading/how-to-note-reducing-corruption-in-infrastructure-sectors/.